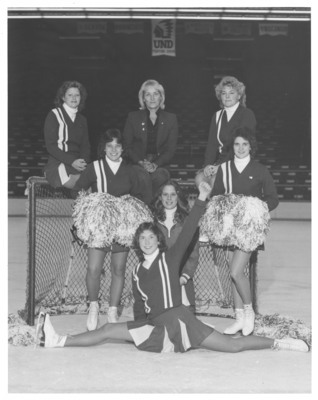 Photograph of 1982 UND Hockey Cheerleaders. Front Row: Mary Schuster. Middle Row: Laurie Mackowick, Robyn Dallman, Susie Hanna. Back Row: Lynn Larson, (Advisor) Karen, and Shawn Carey.